Registration closed on Feb 28 at 5:00 PM. Contact leader to be added or removed from roster. The following courses and competencies must be completed within a five year timespan. Classes or trips previously completed within the last five years qualify, as long as you can locate a leader with personal knowledge to validate your successful completion. Once the participant has signed up, they won’t be held to future standards. Demonstrate, in conditions of wind waves or currents, that you can get back into your kayak in under one minute using a t-rescue AND rescue someone else in under one minute using a t-rescue. Exhibit comfort and control performing strokes, maneuvers, self- and assisted rescues in 12 – 15 kt of sustained wind and 1-2 ft of waves. Exhibit comfort and control performing strokes and maneuvers under tidal current conditions at Deception pass or a similar area, of at least 5 – 6 kt, including crossing eddy-lines, ferry-gliding, and ferrying across a channel. Demonstrate comfort and control while eddy hopping up-current. Demonstrate comfort and control while launching and landing in a minimum of 3 foot surf. Explain the elements and purpose of courteous surf zone conduct and safety, and behave accordingly. In a rock garden zone with wave sets and surge, demonstrate the proper timing and technique to be able to safely navigate from safe zone to safe zone as well as perform, self, assisted and team rescues. Demonstrate VHF radio skills, including knowledge of regulations and the ability to communicate in scenarios such as the summoning of marine assistance and the coordination of safe passage through areas of vessel traffic such as shipping lanes. Demonstrate the ability to identify aids to navigation and landmarks, and navigate in a variety of conditions and settings, such as through complex waterways, long open crossings, and shipping lanes. Be able to maintain the equivalent of a 3 kt average pace for a minimum of a 12 nm trip. Go on at least four Mountaineer day paddles of at least 12 nm. Complete a minimum of three SK IV or V Mountaineer trips in a variety of conditions (ie, current, surf, etc.) and locations. These can also count as your 12 nm trips, if they are at least 12 nm long. 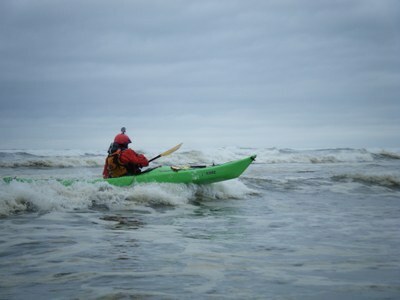 Demonstrate that you have a reliable kayak roll (ie, 80% successful) in conditions such as wind waves, current or surf. Demonstrate the ability to effectively tow another paddler in a variety of conditions including dynamic water. Help teach in any of the Mountaineer branches’ Sea Kayak classes for a combined total of at least 40 hours. Qualified Tacoma Sea Kayak leaders (or other leaders who have been approved by the individual branches) must sign off on each step of this logbook. You can see which leaders have been approved to sign your logbook by looking at the Intermediate Kayak Course (IKC) listed by branch on the Mountaineers website. Approved instructors/leaders will be listed on that branch’s IKC webpage. If your branch does not have an Intermediate Kayak Course, contact the Tacoma Intermediate Kayak Course leader to find out which kayak leaders from your branch have been authorized to sign off on this logbook. To complete this course, the paddler must have passed the Basic Kayak Class (or received Equivalency) and contacted the Tacoma Sea Kayak Chairman to sign up for the Intermediate Sea Kayak Course. Contact Beth Owen at bluekayak123@yahoo.com if you are interested.